For Ada Lovelace Day this year, I would like to celebrate a group of young women in science, technology and making who are celebrating and uplifting each other. I had the privilege of seeing some of them at Maker Faire New York this year, and I find their optimism and strength to be inspiring. Check out their twitter feeds, their youtube channels, and especially the connections they make. It is awesome to see these young women making a difference in the world right now. This entry was posted in General News and tagged STEAM. Bookmark the Permalink. I took a heap of pictures at the 2nd annual Silicon Valley STEAM Festival at the Reid Hillview Airport in San Jose today. This event brings out an eclectic mix of hobbyists, scientists, and enthusiasts showing off what they do. Below are a few of my favorite moments. 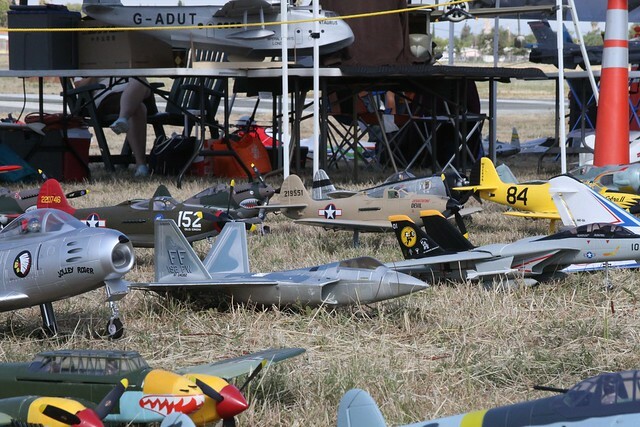 The local RC aircraft enthusiasts not only displayed their aircraft, but also put on an airshow. They also fly at Baylands Park, and encouraged coming to see them on Sundays. 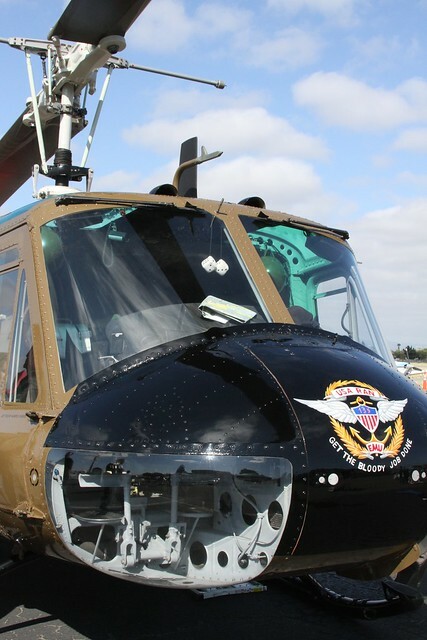 Vintage aircraft flew in to be displayed. 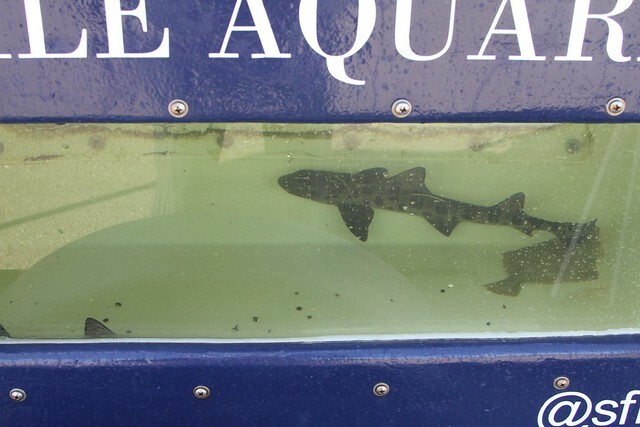 Local science institutions brought their mobile displays, including leopard sharks from the Marine Science Institute. 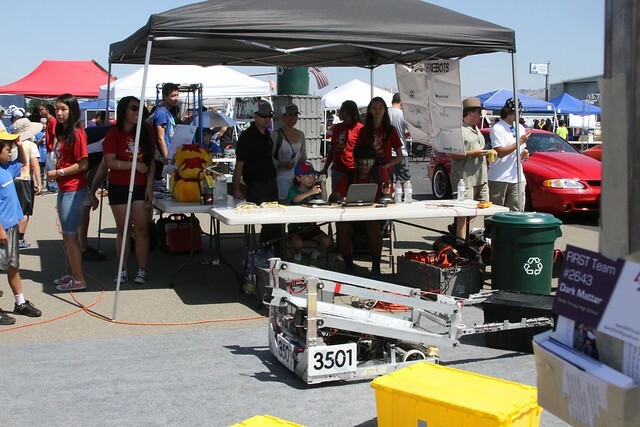 Robotics teams, (including our very own Firebots) were demonstrating their robots in the midst of cars on display. You can find more robots, aircraft, automobiles and sharks in my album here. This entry was posted in Education, Field Trips and tagged STEAM. Bookmark the Permalink. 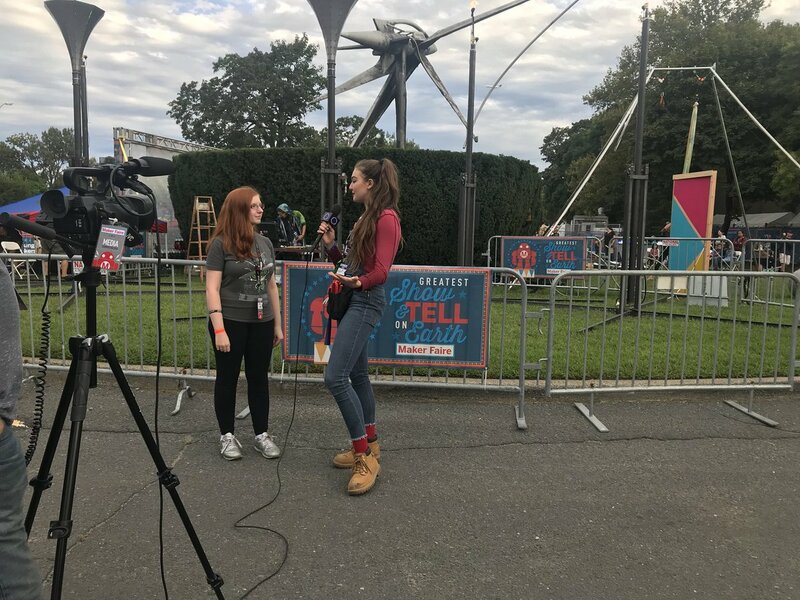 For Lady Ada Lovelace Day, we would like to celebrate some of the women working in science, technology, engineering, art and mathematics that we got to meet and spend time with at Maker Faire New York this year. Our friend AnnMarie Thomas had just released her book Making Makers, and was speaking several times during the faire, including hosting the Making Makers panel I participated in, as well as assisting her daughters, Sage and Grace, in presenting a Squishy Circuits workshop. Also on the Making Makers panel was Sophi Kravitz, who was showing her WobbleWorld virtual reality experience. 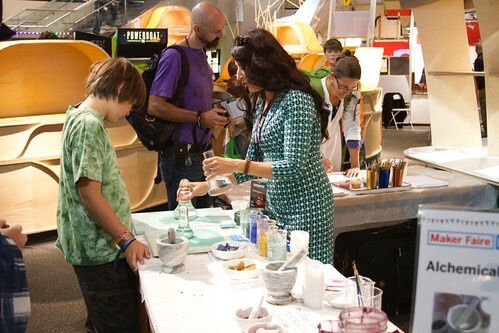 Patricia Miranda of Alchemical Tech was there again this year teaching dye-making. I reluctantly declined her offer to get my hands dirty. Jenine Bressner, who has been sharing her glassworking and laser textile projects at Maker Faire for years, was there as an attendee, finally getting a well-deserved chance to see the faire. 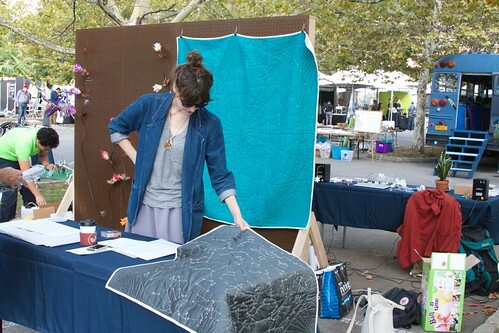 Emily Fischer of Haptic Lab was displaying her beautiful astronomical quilts. Peggy Monahan of NYSci was helping run a costume design workshop with low cost, easy to use materials like plastic tablecloths, butcher paper and snow-cone cups. 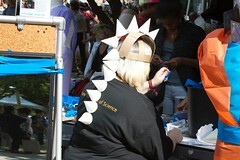 Many people bedecked with dinosaur spikes and other fanciful accessories could be seen roaming the faire. Representing Othermachine and demonstrating the Othermill was their project and support engineer, our friend Simone Davalos. Fellow electronics shop owner and friend Cheryl Hrynkiw of Solarbotics was demonstrating their projects, like the solar marble machine. Rachel Meyer, Selena Ahmed, and Ashley Duval of Shoots & Roots Bitters are three scientists who care about culturally important plants, and bring their stories to people through their uniquely blended bitters. 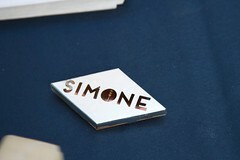 Sharon Shattuck of Eavesmade was selling laser cut and engraved coasters and ornaments of scientists. You can find her sets of women heroes of science coasters and ornaments in her etsy shop. 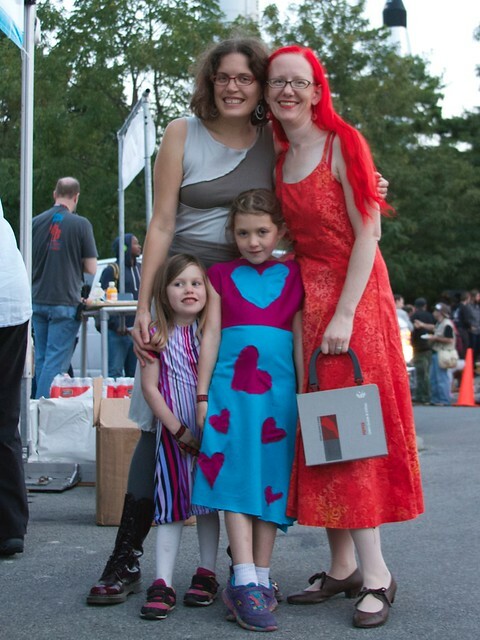 Toward the end of the faire, we ran into Limor Fried of Adafruit. It was great to catch up with her and hear about the great strides her electronics business has been making. There were many more women there showing amazing projects. If I left out someone you want to celebrate, please feel free to share about them in the comments. This entry was posted in Everything Else and tagged STEAM. Bookmark the Permalink. This entry was posted in Art, Engineering, Mathematics, Robotics, Science and tagged STEAM, STREAM, t-shirt. Bookmark the Permalink. Thank you for the kind words, and for your dedication to your students! This entry was posted in Education, Evil Mad Scientist Shop and tagged STEAM, t-shirt. Bookmark the Permalink. 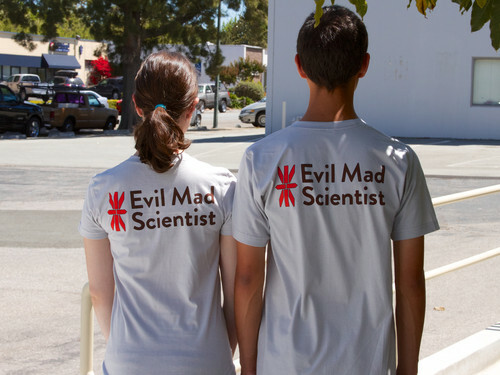 Introducing the Evil Mad Scientist Laboratories STEAM T-shirt. 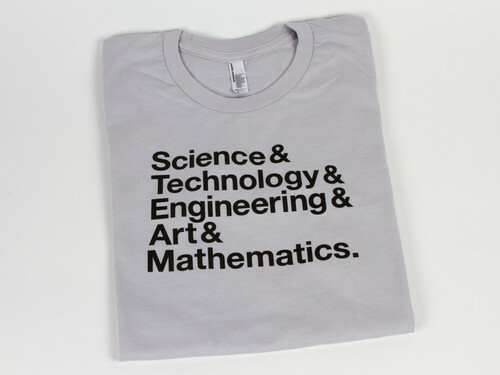 Featuring high quality screen printing on 100% cotton tees from American Apparel. Shirt color: “New Silver,” a uniform light gray. Beautiful quality screen printing by Social Imprints of San Francisco (“Printing with Purpose”). 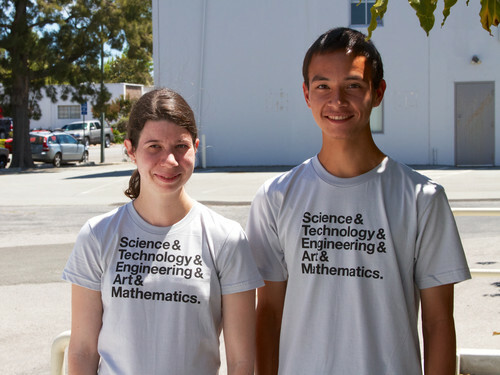 Why Science & Technology & Engineering & Art & Mathematics? It’s who we are, and it’s what we stand for. We, like many, many others believe that art is a critical component of good design, of good engineering, and of beneficial technology. 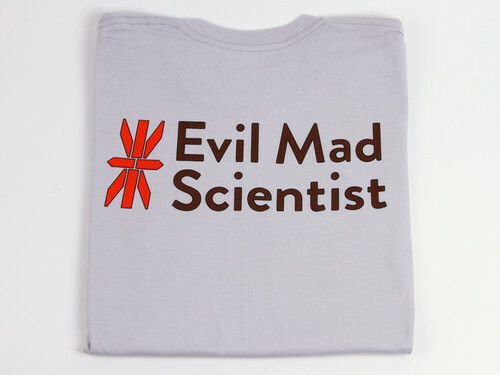 The Evil Mad Scientist STEAM T-shirt is in stock and shipping now! 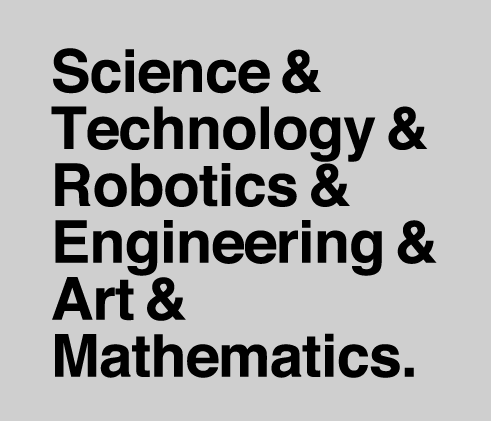 This entry was posted in Art, Education, Engineering, Evil Mad Scientist Shop, Mathematics, Science and tagged STEAM, t-shirt. Bookmark the Permalink.